"But I practiced it a thousand times!" How often have these words of frustration been spoken by students and professionals alike when, after hours of practice, a difficult passage simply remains difficult. 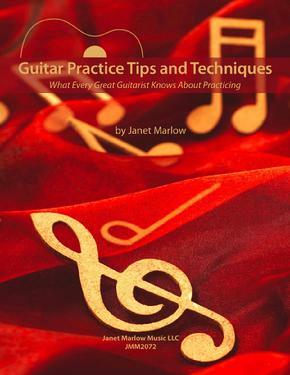 Janet Marlow’s Guitar Practice Tips and Techniques are shortcut methods of getting to the core of a problem while enjoying the process of resolving the difficulty. Each chapter of this book offers a holistic approach to understanding yourself as a student of the guitar. While learning these creative and efficient methods, you will discover that your goals will be accomplished more quickly and more enjoyably. The book’s subtitle, What Every Great Guitarist Knows About Practicing is a theme throughout this book to support and encourage you. Great players use these methods to attain their mechanical, technical and musical goals… and now you can too! Whether you are a classical or acoustic player ,Guitar Practice Tips and Techniques is a companion resource for you on the music stand so you can say, “I’ve practiced it a few times and I’ve got it!”. 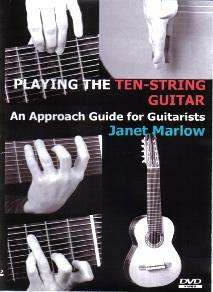 Recently, I purchased the method book and DVD, Playing the Ten-String Guitar: An Approach Guide for Guitarists by Janet Marlow. She is the first to provide this much needed material. More importantly, I appreciate that it is of such quality and usefulness. For me this could not have come at a more opportune time, as I was in the process of trying to sell my 10-string guitar. After years of struggling with it, I could only make good use of 8 of the strings and decided to be an 8-string guitar player. For me, it is the brilliance of the Marlow tuning method that opens up all 10-strings. Like all great ideas, in hindsight it seems so simple, yet I never thought of it. The book and DVD complement each other perfectly. The book is more important in that it provides all studies, arrangements and compositions in notational form allowing a student to actually perform them. However, I found the DVD critical for comprehending all the subtle movements, particularly damping techniques. These things can�t be described and must be seen and heard. The seven 10-string studies, notated using a grand staff, are ideally structured and arranged to allow the student to immediately read and play the bass strings 7-10. Within an hour or two, one is able to progress in huge bounds and can be ready to dive into the three excellent 10-string pieces provided. The studies still have lasting value and must be done on an ongoing basis to continually improve skills in reading, playing technique and just becoming comfortable with the added four strings. Anyone doubting the wisdom of the Marlow tuning method will become convinced upon playing the included arrangement of Bach�s Prelude in C major. No previous guitar arrangement of that work has ever equaled this one. The book also includes an arrangement of Weiss�s Suite in A major, which is very good and a joy to play. The approach guide concludes with Janet Marlow�s master-work, �Three American Landscapes�, which is a beautiful depiction of the American Southwest. To truly express all of the nuances in this piece takes great skill, yet a student can still read through and play most of it and then identify areas of technical weakness to work on. I highly recommend these products to all 10-string guitarists, whether beginner or advanced. I truly believe that I will use these throughout my life as a resource for continual improvement. The Joy of Flute and Guitar collection is geared for the flute and guitarist to enhance the repertoire for this combination for students and professional performers in ensemble. The works include: Greensleeves (Anonymous 16th c.); Mozart’s Spring Etude in Bb Major (Fernando Sor and Janet Marlow); Minuet and Dance of the Blessed Spirits (Christoph Gluck); Sonata in F Major (Georg Philipp Telemann); Sonata in C Major BMV 1033 (Johann Sebastian Bach); Berceuse Op. 16 (Gabriel Faure).